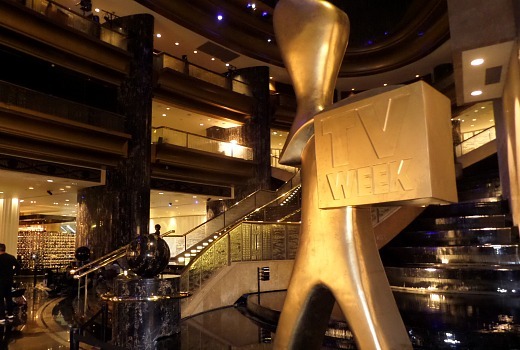 The giant Logie is in place on the Crown staircase, final rehearsals were underway and industry faces gathered for drinks hosted by Film Victoria / Bauer yesterday, ahead of the 59th TV Week Logie Awards. Today a small army of technicians put down the final touches for the Red Carpet ready for the stars to walk its long path from 4pm. Dave Hughes will again open proceedings tonight Live from 7:30pm -ready to take aim at the best of them. After the event is over guests will spill out into the Palladium foyer for a TV Week party before heading off to various network celebrations around the Crown precinct, and into the early morning. Those events are all strictly off the record. TV Tonight will be blogging Live results AEST. Palladium, Crown Entertainment Complex, Melbourne. Dave Hughes, Hamish & Andy, Rachel Griffiths, Alex Dimitriades, Carrie Bickmore, Dannii Minogue, Delta Goodrem, Tina Arena, Erik Thomson, Rebecca Maddern, Claudia Karvan, Dan Wyllie, Shaun Micallef, Mandy McElhinney, Ita Buttrose, Miranda Tapsell, Liz Hayes, Amanda Keller, Pete Helliar, Larry Emdur, Shane Jacobson, Ben Mingay, Pamela Rabe, Leigh Sales, Todd Sampson, Sam Pang and Ben Fordham. What happened to Shaun Micallef being a presenter? Has anyone else checked out the live stream? The sound is all screechy and delayed. Have checked it on 4 different devices. I would’ve watched some of the red carpet on 9s catch up site if it wasn’t account locked. Accounts on catch up sites are stupid. Is the live stream actually working though? Its 4.20pm and I clicked the link to see what happens and it says the stream starts at 4pm and there is a live soon button to click and when you click on that it says page doesn’t exist. So it may not be available yet? Seems odd as it was supposed to start at 4pm. Technical difficulties? Why is Grant Denyer being nominated for Gold Logie??? I don’t get it.